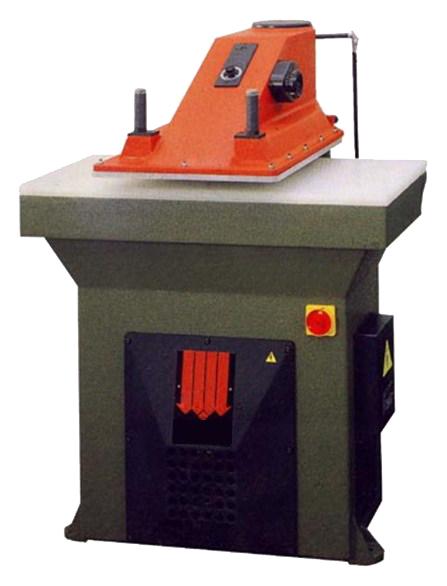 Swing Arm (Clicker Presses) are used for a wide variety of die cutting applications. The most common uses are cutting soft to semi-rigid materials such as fabrics, leather, cork, rubber, foam and other like materials. Our clicker presses are used in many laboratories and testing facilities. Completely hydraulic and made of strong casting material, ensuring powerful, yet quiet running. Replacement cutting bed for the SE8 clicker press, 12 x 24 x 1” thick, white HDPE. Approximate Shipping weight 260 lbs. Approximate Shipping weight 560 lbs. Custom – made Forged Steel Clicker Dies, 1/1⁄4” x 1⁄4” cross-section, with straight or pinked cutting edges, sandblasted and PTFE coated for durability and ease of sample removal. The hardened cutting edges will last for years, although a resharpening and reconditioning service is available for dull or damaged dies. Suitable for all Hydraulic or Pneumatic presses. Provide dimensions or sketch for your personal 48 hour quotation.